The jury is the heart of Anglo-American justice, historically. This situation, although never achieving the ideal, was far better than the current hidebound mess Americans (and members of the Commonwealth) are saddled with today. Today, the American (and most Commonwealth) court systems have failed to provide timely, responsible, fair justice to virtually anyone. The situation is intolerable. In particular, judges (as employees of the government) cannot be fair and impartial, and have achieved the kind of power, individually and collectively, that no free people should allow for anyone. Obviously, even juries can be suborned and corrupted. Which is one reason to require unanimous agreements on verdicts – beyond a reasonable doubt. But it is far more difficult to corrupt 6 or 12 men and women, doing parttime work, than one man or woman paid to wear a black robe. The greatest danger with parttime jurors and reduced power for the judge or justice is that the permanent court staff can themselves run things in a manner that benefits theme and risks true impartial justice. Here is a Simple Solution ™ for a revival of justice. Make the jury the core and heart of the system. Make the judge and court staff serve literally at the pleasure of the jury. Make the lawyer in court clearly subordinate to the jury. Establish an appeals system that depends on juries and not judges. Rotate juries, judges, court staff, and attorneys frequently. Anyone will see that this proposal, this solution, requires thinking far, far outside the box of the modern, unjust legal system. How do we do this? By making the JURY and NOT the Judge the center of activities: the boss in the courtroom before, during, and after a trial. All criminal cases are referred to trial by a Grand Jury majority vote (13 of 24 Jurors agreeing). Civil cases are referred to trial by a mediator or arbitrator following a failed attempt to mediate between the parties. For a specific case, the Jury is impaneled by random selection from voter registration lists. 24 jurors are selected. The Jury meets and assigns a judge (from an established list) by majority vote. The list is maintained as a public record by the local governmental legislative body (board, council, etc.) with input/comments by past Jurors, lawyers, and plantiffs and defendants. Staff are selected by the judge with Jury review and approval. The defending attorney (counsel) is selected by the defendent. The prosecuting attorney is selected by the local civil law enforcement agency WITH the advice and concent of the victim(s). Either the Jury or the judge can refuse to accept the prosecuting attorney (or in civil cases, one or both counsellors). By lot, six jurors are designated as alternates. Schedule of sessions and other matters are resolved and approved by Jury. During the trial, the judge presides and referees the attorney and counsel, and acts as the agent of the Jury, who submit questions through the judge to counsel and witnesses, and who receive evidence through the judge. The Jurors do not speak directly to attorney, counsel, defendent, accuser, or witnesses. 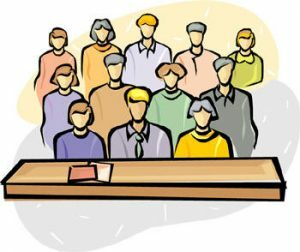 If it is necessary that a Juror be removed for cause, by the other members of the Jury with the advice of the judge, an alternate is seated by lot. The Jury (including alternates) deliberates but may continue to direct the judge to obtain specific information (evidence) and guidance on the law. The Jury decides both the facts and the law as applicable to this case, in written form. The Jury announces its decision through the Judge. For certain situations (defined in law), the Foreman of the Jury polls the members publicly on each issue, charge, and specification. If the decision requires penalty (sentencing, restitution, or fines), the Jury again deliberates after the judge provides guidance on the law. The decision is recorded and announced in the same way as the verdict. If either party appeals, the appeal is assigned randomly to a six-member Appeals Jury established in an adjacent (or nearby) County. An Appeals Jury is one-half the size (including alternates) of a standard (petit) Jury. The original decision (verdict and penalty) must be upheld unanimously by the Appeals Jury. A second-level appeal may also be done to another Appeals Jury in the District or Region, with ultimate appeal to the State Supreme Court. The State Supreme Court consists of one member from each District or Region, nominated by the executive officer of the state with the advice and consent of the upper chamber of the state legislature, and ratified by a majority vote of all jurors who have ever served on a Jury (Petit or Appeals) working with that nominee as a judge or court staff. The State Supreme Court members are subject to a retaining vote every two years, and are limited to eight years service. While far from perfect (can any human institution be so? ), this simple solution is proposed and readers are asked for comments and suggestions. The various ideas incorporated are taken from ancient practices (including mining districts and other frontier institutions), at least one Texan republican movement, Heinlein and other writers, and classical liberal philosophy. None of us will mind you poking holes in it. Obviously, this sort of system requires more knowledge and education on the part of jurors, as well as an understanding and acceptance of their responsibilities and accountability. But that is a point to discuss some other time. Please feel free to comment, tear down, build up, and suggest alternatives or tweaks! This entry was posted in Nathan's Rants and tagged attorney, counsel, Court, grand jury, judge, jury, justice, justice system, lawyer, petit jury, trial. Bookmark the permalink. Well, I wouldn’t call this ‘simple’, but I would sell my house and move to a jurisdiction where trials were done this way. I agree that the jury is the heart of the situation. The largest problem I see is that in our present day, judges have become politicized as well as the average jurist being uneducated or brainwashed by our politicized public school system. Most jurists are, at best, aggravated by having to spend their time on a jury, until of course they are the ones being tried for whatever crime or infraction of law. Most that ever serve on juries are unaware of their duty, and are ill-advised by the court on their duty. Their duty is not only to judge the facts as presented but also to judge the “law” as it pertains to the case. Whether it is a just law or itself has no merits. If an unjust or meritless law it must be ruled null and defendant should be absolved of all charges. There are so many laws on the books that have no merit and are simply written and enforced for coercion of defendants it’s actually pretty scary. Garnering power and control of the ever encroaching police state. If we do not return to the principles our Constitution outlines we are in dire straights, with little hope for a future. We will end up as mere subjects. We will become mere slaves. subjected to the whims of a ruling elitist global governing body.